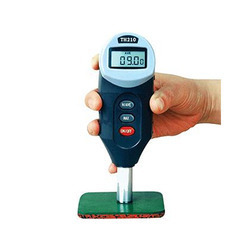 We are a leading Wholesale Trader of hardness testers, shore hardness testers, electromagnetic field tester, gauss meter testing equipment, acidity testing kit and conductivity tester from Mumbai, India. Application: shore C is designed for various foam and sponge. 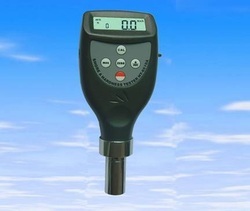 Product info : Digital durometer for shore hardness testing pocket size model with integrated probe. Test scale : shore hardness. Standards : DIN53505, ASTMD2240, ISO7619, JISK7215Parameters displayed: hardness result, average value, max. value. Measurement range:0-100HCMeasurement deviation:1%H. Resolution : 0.1Auto switch off. With RS232C interface. Operating conditions: 0 to 40Power supply : 4x1.5V AAA (UM-4) battery. Battery indicator : low battery indicator. measure electromagnetic field radiation levels around power lines, home appliances and industrial devices. 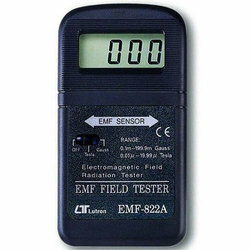 The EMF tester is a cost effective, hand-held instrument designed and calibrated to measure electromagnetic field radiation at different bandwidths down to 50 Hz/60Hz. 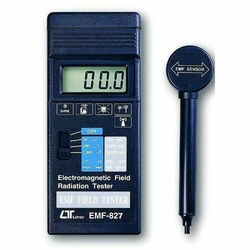 Applications: This EMF tester is specifically designed to determine the magnitude of electromagnetic field radiation generated by power lines, computer's monitor, TV sets, video machinery and many other similar devices. electromagnetic field radiation levels around power lines, home appliances and industrial devices. Separate probe, easy operation & remote measurement. Wide measuring ranges, 20/200/2,000 micro Tesla, 200/2,000/20,000 milli Gauss. electromagnetic field radiation at different bandwidths down to 50 Hz/60 Hz. A. 1.1 ml portion of the insulating oil (approximately 1 gm) to be tested is accurately pipetted into a clean dry test tube. To this is added 1 ml of rectified spirit (ethyl alcohol) and the mixtures is gently shaken. One ml of solution of 0.0085N sodium carbonate is then added. After shaking the test tube again five drops of universal indicator are added. The resulting mixture develops a colour depending upon the PH value of the mixture.Oil having total acidity of 0 to 0.5 shall show transition colours from prussian blue to yellow. Whereas those having an add number of 0.5 and above shall show a change from yellow to vermillion. 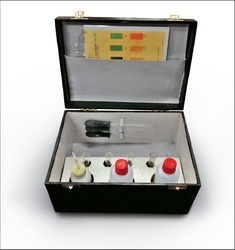 The chart supplied with the Kit gives the colours obtaind by using this test on oils having neutralisation (total acidity) from 0 to 1.0. 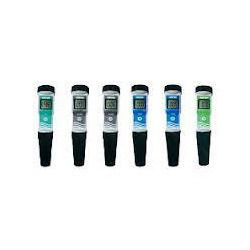 Fast response, reliable and accurate measurements.˜ Large LCD display 21 x 18mm for easy reading.˜ Impact resistant ABS case by waterproof designed IP 57 rated.˜ 1 or 2 points (pH only) manual calibration via screw trim pot.˜ The electrode module are changeable for replacement by user. 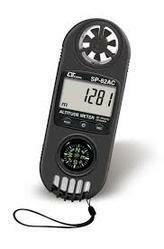 3 in 1, Precision Altitude meter Barometer Compass. Build in precision baro sensor for the atomsphere value and altitude measurement. Tiny bone shape with lightweight and small size case design are suitable for handling with one hand. Wristlet design provides extra protection to the instrument especially for user one hand operation. Built- in microprocessor circuit assures excellent performance and accuracy. Concise and compact buttons arrangement, easy operation. Memorize the maximum and minimum value with recall. Hold function to freeze the current reading value. Display 8 mm LCD display. Operating Temperature 0 to 50° C (32 to 122° F). Over Input Indication of "- - - - ". Power Supply CR 2032 DC 3V battery. Weight 160g ( battery included ). Dimension HWD 120 x 45 x 20 mm (4.7 x 1.8 x 1.2 inch). Looking for Testing Equipment ?